The Other Five Percent was a quick read, once I got into the storyline. I must be honest, I struggled for the first chapter or so. The narrator was very dry, too observing, with every little minute detail taking a chapter many pages instead of the three at most it would’ve taken to show the meat of the story. To be honest, this is a pet peeve of mine – inane, unnecessary detailing taking up wordcount while burying the important facts of the story beneath the mountain of description. I was a bit taken aback in the beginning, as I’m a huge Quinn Anderson fan and this is so unlike her usual writing style. If this is also your issue, and you’re reading this review because of it, KEEP READING – the book, not my review. The detailing sets too much of the scene, but it truly does showcase the characterization of our narrator, Logan. It wanes off after the first chapter, allowing the story to rise to the top. Logan is a stuffed suit, a little bit boring. He doesn’t need to get out of his shell, because he’s not in one – he needs to actually get a life. Work. Talking on the phone to his sister. Work. Wanting a cig so bad he mainlines caffeine. Work. Co-workers. Logan is an introvert who doesn’t open his world up very large. A chance meeting at Starbucks has his world crashing at his feet – an old friend from college, one who was ‘more’ than a friend, pursues Logan. I was surprised how the story unfolded. Ellis was an interesting character. Strong and assertive. He was the perfect counterbalance to Logan – who needed someone to challenge him in all ways. I don’t wish to point out the entirety of the plot, as I went in blind, and I won’t ruin it for those reading this review. The story was a quick one, which is something I look forward to when I’m busy but wish to be entertained in two to three hours, when most books take a whole day without interruption. But, with a shorter novella, there are some things that have to be overlooked for the sake of page-count. The story and relationships evolve at a much quicker pace to fit into the book itself. Don’t expect the content of a 400+ page book in a novella. This is a novella – read it as one. I felt the author did a good job, laying the groundwork in the past, but not going into great detail with flashbacks, leaving the reader’s imagination to fill in the gaps. I’m perceptive enough to grasp what Ellis was feeling, getting that gut-twisting sensation for the man, without it being bogged down in flashbacks and the details, so I appreciate how the author gave me a fast-paced read where I was able to use my imagination. Other than the rocky beginning, I fear some readers may not ‘get’ Logan. Introverted, slightly emotionally closed off, to the point he’s blind to what others are feeling, not in general but about him. He’s also heavily in denial, not out of malice or a lack of intelligence – a lack of self-reflection. Logan has always been so busy moving forward, school then work, he didn’t look back to see how the past and present affected him, being too lost in what may be the future. Logan says he’s 95% straight and the other 5% belongs to Ellis. This very well may be the case. Yes, he’s bi. Yes, he doesn’t seem to get that. Being bi doesn’t mean you 50/50 want men and women – it truly is a sliding scale. After the beginning, the book moved at a rapid pace, and I read it in one sitting. I didn’t want to put it down, and was blessed that no one interrupted me until I was finished. It was a guilty pleasure read, one in which the author did a great job showing the evolution of the character as he came to terms with his sexuality, while righting the wrongs of the past. I look forward to everything the author publishes in the future. Logan has dated women since college, even though he messed around with guys in college, jokes that he is 95% straight and had a pretty serious relationship with Ellis in college that he seems to have forgotten, until he sees Ellis again. At times, I couldn't connect with these two, but other times I felt I was right there with them. There were a few times I just wanted to stop reading because I didn't feel connected or cared if they worked things out. The book was wordy at times and I found myself skimming a lot. I did really like Logan's sisters, they were a hoot! Once things got rolling and Logan and Ellis started actually talking and working on things, the book turned out okay and they got their happily ever after. Told entirely from Logan's point of view, it doesn't take long to realise that Logan likes things a certain way and has particular ideas about how things in his life should be. It was also easy to see he lacked a maturity in spite of the image he is projecting. When Logan bumps into former best friend, Ellis, at Starbucks, they awkwardly reconnect. Logan can't remember why he lost touch with Ellis and when Ellis reminds him what happened, my heart hurt for Ellis and I was disappointed in Logan. But as the story moved on, Ellis behaved like an uppity jerk and Logan continued to keep his head in the sand and insisting he was straight, I kind of felt like these idiots deserved each other. Logan and Ellis are complete opposites and, at times during their difficult reconnection, I wondered what they saw in each other and I found them to be a very frustrating couple. I was happy for Logan by the end of the book, but it was a struggle getting there. I really enjoyed this story about an unlikely second chance romance between an office drone and his unconventional college friend. Logan is very difficult to like at the start of this book. He is a mindless corporate zombie with pointless corporate ambitions and limited self-awareness. However, when he reconnects with Ellis, he is forced to reconsider the choices he has made in life and the identity he has created for himself. He isn’t likeable at the start of this story but he does grow into someone I can respect by the end of the book. Ellis is an easier character to respect. He is willing to risk the financial security Logan enjoys by choosing to work outside of the mainstream business world. He lives true to himself and he is more comfortable in his own skin than Logan is. I might be reading too much into a simple romance, but Logan and Ellis seem quite representative of their generation and the compromises all Millennials are forced to make. Despite shared early experiences, their adult choices have led to Logan and Ellis living very different lives in the same town. I enjoyed the way both these characters are forced to reflect, compromise, and grow in this story. I loved the history between these two and the tension between them in the present. Logan’s bewilderment at elements of Ellis’ world is amusing. This story is quite different than the other books I’ve read by Quinn Anderson. The characters are a little bit older and there is a little less humour here than in her Murmurs Inc. books. While it is a light romance, parts of this story were quite thoughtful and reflective. This is a great take on a love story. Logan is a man who, just four years ago, blanked a whole series of events from his mind, until he sees Ellis in a coffee shop. Even then it turns out not everything was as he remembers it. As the layers are peeled away and he makes more gaffes than anyone really should – expect to be holding your head at his utterly thoughtless comments – it may be too late for him to resolve the situation. Luckily by then we have some sympathy for him and with some encouragement, things may just work out after all. This manages to be a second chance, as well as a coming of age story, and I really enjoyed it, thank you Ms. Anderson. 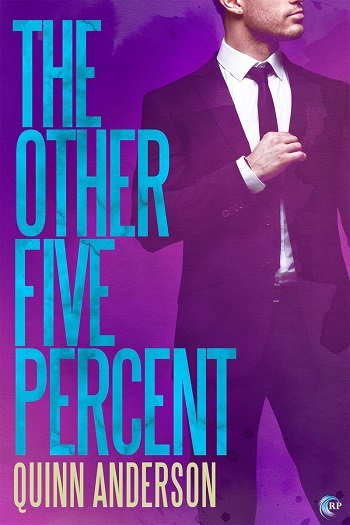 Reviewers on the Wicked Reads Review Team were provided a free copy of The Other Five Percent by Quinn Anderson to read and review.